This impressive gift basket is filled to the brim with a delicious array of fresh fruits, crackers and cheese. Makes a delicious corporate gift. 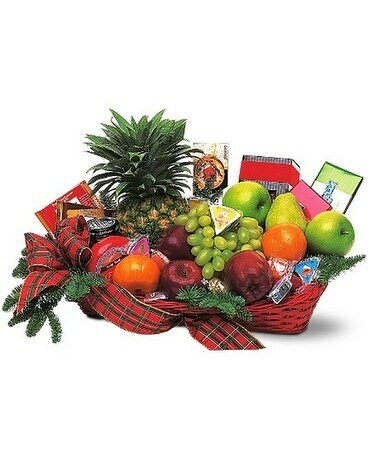 Pineapple, apples, oranges, pears and tangerines, along with biscotti, biscuits, candy, cheese and chocolates, arrive in a rectangular tray tied with plaid ribbon. Approximately 24" W x 15" H Please note: Same-day delivery is not available for this item. Please allow one additional day for delivery.